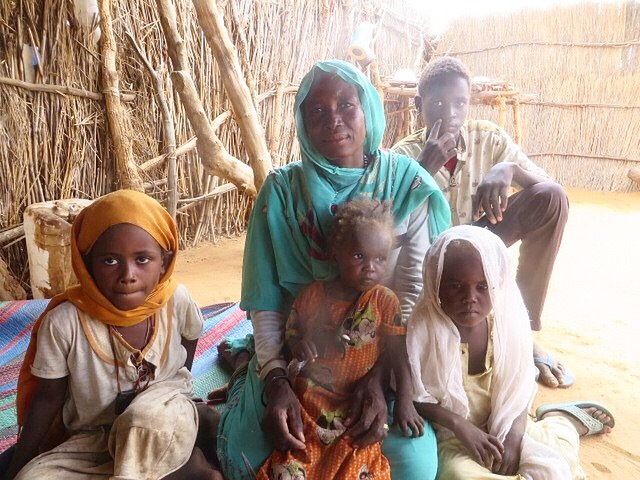 Hassina is 40 years old and has six children, three of them under the age of five. Last year there was drought in Darfur, which meant Hassina and her family had very little food to eat, and sometimes went days without any food at all. With no food, no way to earn an income, and the closest source of water miles away, Hassina has not been able to send her children to school. Her youngest daughter is malnourished. Lack of nutrients at such an early age, when children are still growing, can be devastating. The colour of her hair has turned from dark to light because of the absence of protein. This is just one of the visible signs, but with no help, she is at risk of suffering physical and cognitive impairment for her whole life. Earlier this year, in addition to focusing on providing aid to help families in our villages suffering famine, Kids for Kids was also able to adopt five new villages in Darfur. Hassina’s village, Teiga, was selected, and Hassina was named one of our first generation beneficiaries. 2018 has been a year that Hassina will remember forever. After completing inception meetings in Teiga village, animal husbandry training took place where Hassina and all the other beneficiaries were taught how to care for the goats and donkeys, keep them in good health, and identify any illness or injury. Hassina has now been loaned five goats and given a donkey and farm tools to help increase the amount of land she can cultivate, plus two mosquito nets and two blankets. She was too poor to replace the plastic jerry can she had used for collecting water and had been sharing her neighbours, but that meant sharing the water too. It is hard to think of families so desperately short of water in the heat and sand of Darfur. We also now provide two jerry cans for each of our beneficiary families. In addition Hassina will be sharing the use of a donkey plough with two other families so they can cultivate more land, enabling them to grow vegetables as well as the basic crop of sorghum, and, because billy goats are now so expensive we provide a good billy goat to be shared between them too. With these basic essentials, Hassina will be able to provide goat’s milk for her children, ensuring they are no longer malnourished, and sell excess milk and yogurt. It takes just one cup of goat’s milk a day to transform the health of a child. As her little flock grows she will be able to build up an income for herself – something beyond her wildest dreams. It is planting season now, so when at last she has a harvest, she will also be able to sell any excess she grows at the market. Hassina is now able to plan for her family. Her priority is education for her children and she will now be able to send them all to school. Our help is enabling her to help herself and her family, improving their lives long term. Hassina, and other mothers like her, show us every day exactly why what Kids for Kids does is so important. Hassina is just one of the women that has been chosen as a first-generation beneficiary in our five new villages. Each community has democratically identified the families (15% of the total families in each village) that will benefit first from Kids for Kids projects. 154 women across these five villages have now been given a package of basic essentials just like Hassina: Goats for milk, a donkey as the only transport, blankets to keep warm in the cold desert nights, farm tools to cultivate more land, mosquito nets to prevent malaria, and more. These items will enable them to begin helping their families out of poverty and changing their futures. The community also selected those volunteers that will become midwives, paravets and first aid workers, providing sustainable help to the whole village. Childbirth is no longer something to be feared. Now that Hassina and her friends have ‘household assets’ and are able to earn an independent income, they have status and at last are listened to in village meetings. Hassina no longer wakes up each day with the fear of not knowing how she will provide food for her children to eat. Who would think that goats, blankets, farm tools and the other simple things Kids for Kids provides with your help, could change women’s lives so dramatically? Hassina is looking forward to the future, not just for herself, but for her daughters too! Your support is making it possible for people like Hassina to create a better life for herself and for her children. If you are interested in supporting our projects that empower women, please visit our Gift List to choose what you would like to donate. If you are outside the UK and would like to support Kids for Kids, please visit our project on Global Giving. By supporting and sharing our work, you can help us help more women to feel empowered, giving them the tools to change their futures for good. Help us Bring Goats to More Families like Hassina’s!